Vino! 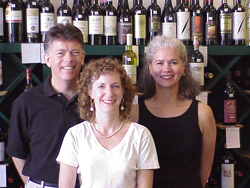 got its start in 1995 when good friends John Allen, Nancy Sazama, and Jennifer Haglund collaborated to invent their own wine store. With support and encouragement from his brother Rick in 1987, John set a long-term goal of operating just such an independent shop. He began by working evenings in the wine and coffee bar at Lindaman’s Restaurant on Spokane's south hill, while holding a daytime shift downtown in the Gourmet Shop of the Crescent department store. Then, after a brief ownership role with another small wine store, he spent four years as the full-time Wine Manager at downtown Spokane’s 4-Seasons Coffee shop. While there he held ongoing classes, developed a unique new Wine of the Month Club, and met Nancy and Jennifer who were excited to help design and conduct classes. Nancy’s background in business management with a Hewlett-Packard outlet, and Jennifer’s experience with marketing and restaurants, brought together the perfect set of talents and resources needed to open Vino!-WineShop at the west end of downtown Spokane. With assistance from a small group of local investors the store began in October of 1995, with 150 monthly wine club members, which today has grown to over 1000. Their goal has been to provide a well-run retail wine operation where it is fun to shop, provides an easy, friendly access to wine information, and is a most enjoyable place to work. Although most customers are nearby, with the help of the internet and emails Vino! 's reach has grown well beyond the local market, providing top-quality selections to customers throughout the United States.